My cellphone battery went on the fritz the other day, so for the first time in I’m not sure how long, I haven’t had my cell with me when going out somewhere. No looking up my book shopping list that I have saved to Dropbox, no checking Twitter while we wait for our food at restaurants, no checking in to Swarm, no reading what few news sites I still actually read with any regularity. I’ve had to make do with analog diversions such as the local paper or whatever’s playing on the big screen above the tables. Or, y’know, talking to people. I was able to enjoy yesterday’s errands without distraction or needing to get somewhere or find something specific. I spent an hour or so at Green Apple Books (I had a few items to pick up that we’d ordered), did a bit of shopping close by, and stopped at Café La Flore for lunch. My only entertainment while eating was a writing magazine I’d picked up. I’ll be honest, I already knew that I’m online way too much. 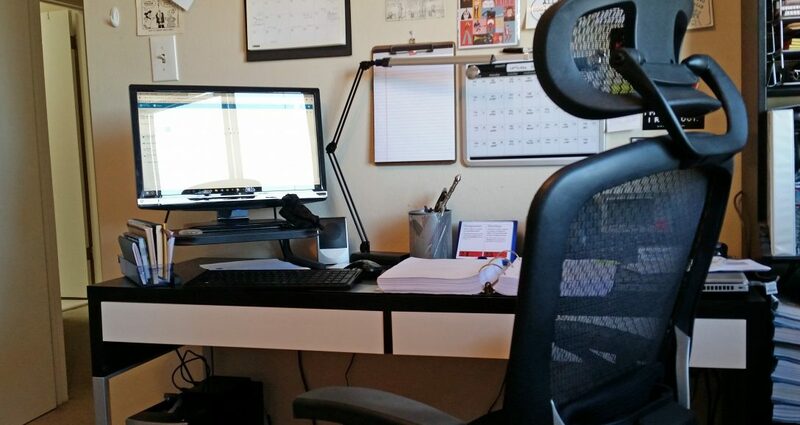 Working from home, I have my work laptop at one end of my desk, and at the other end of it is my home PC, where I’ll distract myself with some online radio station, my Twitter feed, my email, YouTube, or whatever else might be going on. I’ve already made a conscious effort to lessen my dependency on social media and newsfeeds, especially when I sense that I’m about to be irritated or annoyed at something currently trending. Again, it’s the white noise — it tires me out, and I don’t feel like adding to it anymore. So I’ll close whatever tabs I have open, save the radio station (or my music player), and do something offline. I’ve also made it a point to use my work breaks for longhand writing, which forces me to cut screen time as well. Yesterday’s errand-running up Clement Street was definitely a nice diversion, especially since it forced me to think of other ways to distract myself other than via my cellphone. And more to the point, it was a reminder that being online really is a bit of an addiction, at least for me. The good thing is that I’m aware of it, that it cuts into my personal time and my writing time, and that I’ve been doing things to combat it. I make time for things, because I know that in reality, most of the things I want to do don’t take that long at all. A bit of guitar noodling? Working on my art? Writing in my journal? Writing a poem? Surely I can afford to take an hour or so out of my day to dedicate to those projects. Lately, I’ve been noticing just how true that is, once distraction has been taken away. And without a cellphone (which, let’s be honest, I use mainly to go online, and not to call anyone), I’m finding myself with more time on my hands, connecting to the world in a different way. It’s slower and there’s less novelty to it, but that’s just fine. I get to enjoy the Zen-like quality of people-watching and letting my thoughts percolate for a bit. I get to listen to the world a little more closely. Overhearing interesting snippets of conversations and pondering what the context may be. Noticing habits, personal tics, cultural quirks. Thinking about why people do what they do. Letting it all enter my memory without having to take pictures of it. Everything that goes into character development and world building. Am I going to keep this up, once I finally get my replacement battery? Who knows. But for now I’m just going to continue with this acoustic living for a bit longer. I’ve really come to enjoy it. Previous Post Busy, but productive!